Mid-January already and I wonder where those days went…we’re here, then we’re not…we look back and wonder what we’ve done with the days, our lives…and think about all that we let slip by. A winter garden is a magical place of evergreens and early flowering shrubs, while flower-like clusters of winter seed-heads and berries trimmed with frost sparkle like precious gems…and a party of wildlife everyday! Winter days slip by…and then comes a morning filled with sunshine and warmer temps and you know it’s time to pull on the garden clogs and go outside to play. Make a pine cone feeder for your feathered friends…suet is shown in the photo but I also add a hearty slather of peanut butter on occasion! These feeders are simple to make and will teach children an important message about the importance of wildlife in the garden…Be sure to feed the birds and provide a source for fresh water! Make a perfect winter salad…much of the greens come from the garden, kept snug in the cold frame of hay bales and old windows as top cover! Winter Salad…use 2-3 cups of fresh spinach, 1 cup of kale, a large shredded radicchio; 3 blood oranges, peeled and segmented , or baby tangerines; 1 cup of walnuts or pecans toasted and roughly chopped…For the dressing: 3 tablespoons Champagne vinegar, 6 tablespoons of walnut oil, juice of one blood orange or juice equivalent, 1 tablespoon of honey…mix well and season with sea salt and freshly ground pepper. Winter Walk…Banish thoughts of somber days…Expose your centrally heated self to a good long walk through the woods… Pulling on my “Vintage Carl” Faconnable barn coat and favorite cashmere scarf, I trudge out to the shed to get my small garden wagon. I like to pull it with me on walks to hold any treasures I might find, and it also carries my good bow saw and Felco trimmers…all for gathering pieces of kindling and a huge bunch of some fresh and fragrant greens to plop in a vase. Breath blowing dragon steam in the air, Holly running ahead chasing a squirrel only to stop at the base of a huge oak tree…the furry critter had scampered up the trunk to the closest branch…its’ scolding chatter breaking the crystal clear silence! Holly looked back at me, then up the tree at the squirrel, and then back to me with her ears cocked as if to say…Well, what’s up with that!! Back at the house, I stow the kindling and load the wheelbarrow with firewood and roll it to the back porch…a great night for a fire! Having saved all the lavender and rosemary trimmings for fire starter bundles, I pile then on the fire grate, add some gathered kindling and light a few pieces of recycled paper wrapped around the wood trimmings…soon the fireplace is filled with roaring, crackling, fragrant warmth! In the Garden…if you can find them, dormant fruit trees can still be planted, usually up until the end of February. Plant using my “hole amendment” method, mulch well and be sure to water appropriately during winter dry spells. Top dress with good compost to feed as they sprout leaves and grow. Remember: NEVER PILE MULCH UP AROUND A TREE TRUNK…MULCH THE SOIL AROUND THE TREE. In the Shed…during every winter season I urge gardeners to clear up clutter and organize the shed. Clean and oil tools and hang them where possible, recycle any old plastic pots, collect broken pieces of clay pots and store for later use…have your lawnmower serviced or do it yourself…you’ll be filled with a sense of accomplishment and be ready for spring! In the Kitchen…The fragrant zest of citrus fruits has always been associated with winter…Lemon Madelines on a cold morning…so luscious…and orange jumbles, arrrgghh…a mixture of almonds, butter, almond flour, some sugar or agave and lots of orange zest and juice! A path is a line, straight or constantly curving, that draws you along, guiding your stroll through the garden…all the while offering a sense of progression through diverse planting areas. 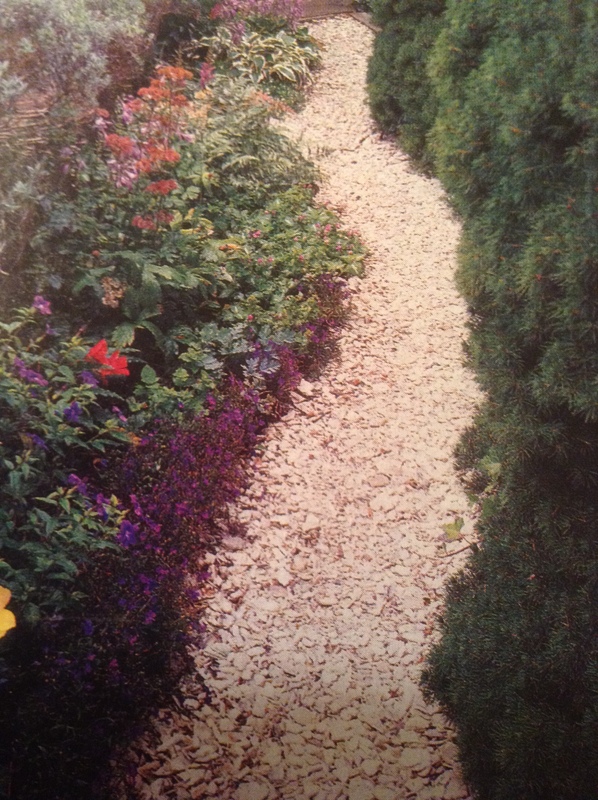 Path materials should be consistent with the style of the house and garden. For example: a frame house in the country lends itself to a sinuous and relaxed gravel path; and a larger, more architecturally distinctive home may be better suited to brick, stone, cobbles or a combination of materials set in attractive patterns. Changing path materials can also be used to define different areas of function in the garden…a gravel path that leads to an enclosed spot for a chair and table where one could enjoy a view of the garden…flat stones in an irregular pattern could also be used for this spot. Keep repeating function, form, scale and rhythm so that your path bring the parts of your garden together. I remember a favorite path through a friends back yard garden in Texas…she used a mixture of materials in a rather clever way that became a very charming aspect of her entire garden…she started with 2 feet of OLD brick laid in a pattern, then 3 feet of old stone pieces fitted together like a puzzle, then 2-3 feet of pillowtop terra cotta tiles, then alternating with more stone, more brick, some broken clay, some old Mexican tiles…all in a 3’wide path meandering through her garden of old roses, rosemary, lavender and other herbs, perennials and a cedar arbor. It was so inviting and fragrant and the path just added that absolute ZING!! A few of my favorite things…on the shelf [right], which is actually an old adobe brick mold, is a very precious gold treasure box given to me by an antique dealer in Gloucester when I was 10 years old, an old digging fork on the shelf is one of a collection, two floral accents from dresses I wore in the late ’60s, a handmade twig chair [part of another collection] and a special photo of my daughters and me! To the left is another priceless wooden box purchased at a flea market when Jeanine and I were in France, a special kitty, the book is obvious and a photo of my grandparents on the day they were married! Below, another digging fork, a tiny china plate from France, an espresso cup and fragrance from Provence…an old level sits on the edge. It’s late, time to throw more wood on the fire and get a glass of wine…soon it will be time for Justified !! Previous Article Stories…full of warmth and good cheer!